I made a few custom UT backgrounds for UT. 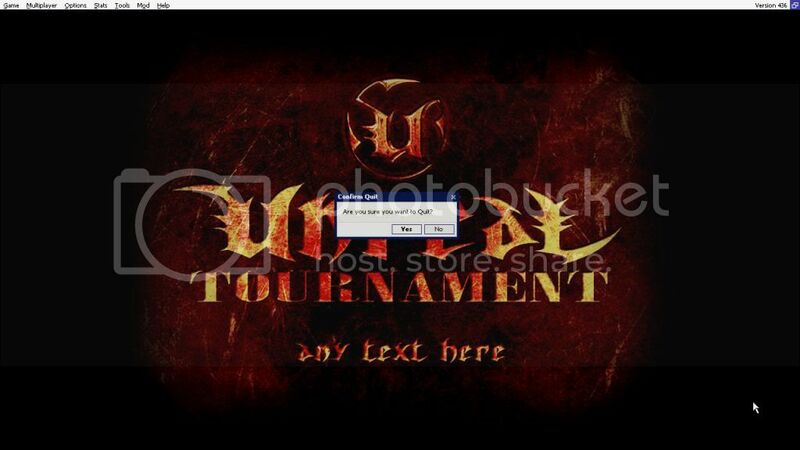 I changed the black and boring unreal tournament into different ones. they all have a black-ish background so you can see the white letters when connecting to a server ( just incase theres a missmatch file and you cant see it ). here they are. to download any of these, just download them, put them into your MAPS folder and i suggest moving the UT-LOGO-MAP to a safe place just incase you want it back. oh, to have these appear, go to OPTIONS and go down and uncheck SHOW DESKTOP and you'll see the black and boring unreal tournament background. here are the new custom ones i made. Download, TAKE OFF THE NUMBER IN THE FILE NAME ( UT-LOGO-MAP1.unr >>> UT-LOGO-MAP.unr ) and put into your MAPS folder. The other day I accidentally discovered something crazy too. I accidentally disconnected from a server when I was trying to 3rd view a person, but instead, I 3rd view my background and moved my mouse and there went my background. LOL... it move! So I was thinking if you have a long-like wall paper, you can 3rd view and turn to see them. @Crsk can you send me that background please, im in love with it. Also would like a custom text below it if you will do it for me? @'Zac screens of these would be good? Last edited by |uK|B|aZe//. ; 05-22-2013 at 05:56 PM. @OuTlaW i can, but i dont have photoshop so i need moko or someone else to turn in into a 256 x 256, indexed coloured, and saved as a .pcx. if you can do that, then you can send it to me and ill put it in. Last edited by |uK|B|aZe//. ; 05-22-2013 at 06:27 PM. i was thinking in release the .unr (background for show desktop unticked) and the .u (new gui theme + background for show desktop ticked), but i'm lazy so maybe i'll just give the background to you or anyone who ask.